I'm the type of gal who likes to enjoy a night out on the town on with my friends. But worrying about calories hardly made me the life of the party. I'm the type of gal who likes to enjoy a night out on the town on with my friends. Usually, we hit the bars and go dancing, but in the past, my diet mentality put a serious damper on the evening. Worrying about calories hardly made me the life of the party! But I've learned four key rules for incorporating strategic splurges into my normally healthy habits. It's no surprise that the calories in cocktails quickly add up. My trick to staying out just as late as my friends without damaging my diet? I take a break between rounds. For every cocktail that I enjoy, the next beverage in my hand is a glass of water or seltzer. Plus, seltzer with a wedge of lime looks and feels just like a cocktail, but without all the booze and calories. I traded high-calorie cocktails for vodka and seltzer, but sipping through a straw made me drink too quickly, meaning I'm more likely to refill sooner. It wasn't until I was accidentally served a drink without a straw that I realized just how much I must be slugging down. Now, anytime I order a cocktail, I make sure to leave the straw on the bar. The empty calories in alcohol never fill me up, so I usually feel hungry after a night of drinking. My friends like to grab a pizza or order take-out at the end of the night, but I'm never able to control myself around this type of late-night fare—especially since my inhibitions are low after a night of drinking. For me, the key is to seek out healthy alternatives, like mixed nuts, low-fat cheese and crackers, or pita chips with hummus, so I don't go overboard on the unhealthy stuff. If these snacks aren't available, I'll share a single slice of pizza with a friend and rehydrate myself with plenty of water. On the nights when my friends are really in the mood to throw back a bunch of drinks at the bar, I offer to be the designated driver for the evening. They always appreciate my gesture because they don't have to worry about coughing up cash for a taxi home. 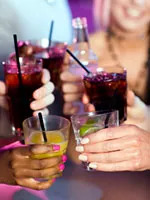 It also gives me a reason to hit the dance floor and enjoy diet-friendly, nonalcoholic "mocktails" (like seltzer with a splash of cranberry juice) instead of high-calorie cocktails. Plus, I don't wake up feeling like I had a late-night out on the town.